Thursday, April 18th, will be our first evening distribution ever. We’re excited about giving clients and would-be clients who are unable to come to our regular second-Wednesday-of-the-month morning distribution an opportunity to receive groceries from the Barre Food Pantry. The evening distribution will run from 5:30 to 7:00 pm, coordinating with the Barre Congregational Church’s free monthly Community Friendship Supper which runs from 5:30 to 6:30 p.m..
Those who are so inclined can come for a warm meal with good company and then come upstairs to gather groceries to take home with them. We will try to make this distribution as much like our Wednesday morning distributions as we can. In addition to reminding folks that this first evening distribution is going to happen, we want this email also to invite both new and experienced volunteers to come to the church to help with the distribution. Some of us will start gathering about 3:00 to set up tables, stage food for clients onto the tables and do those other little tasks which prepare the pantry to function smoothly for our clients. You are welcome to join us any time between 3:00 and 7:00 p.m. to help with the set-up or to help clients shop their way around the tables and carry food to their cars. From this month forward we will be offering groceries to community members twice each month, both on the morning of the second Wednesday and on the evening of the third Thursday. Please join us whether as a volunteer or as a client. We will be happy to see you! Organize a food drive. Plan a dinner or other charity event. The Barre Food Pantry has received a large donation of health, first aid and beauty products from CVS, which will be made available to food pantry clients. Jennifer Lish, a member of the Temple Emanuel Sinai congregation in Worcester coordinated the donation. A group from Temple Emanuel Sinai picked up the boxes and plastic crates of items from CVS in Walpole and brought them back to Holden. The CVS donation includes an assortment of sample size, small and some full-size products such as mouthwash, cough drops, aloe vera gel, cold packs, heat wraps, fiber gummies, cell phone chargers and bottled water. Volunteers Chuck and Lee Radlo picked up and brought the products to the Barre Food Pantry to be sorted and ready for distribution. We are most grateful to CVS for donating these items. And we thank Temple Emanuel Sinai for making them available to the Barre Food Pantry. The Barre Food Pantry at the Congregational Church is adding a second monthly distribution of food to area residents. The additional distribution will be held from 5:30 to 7 p.m. on the third Thursday of each month. The first evening distribution will be on April 18. The new evening distribution date will correspond with the monthly Congregational Church Community Friendship supper at the church on Park Street. The free community supper is held from 5:30 to 6:30 p.m. every month. Area residents can participate in either or both. The regular monthly food pantry distribution is held from 10 a.m. to noon on the second Wednesday of each month at the church. That schedule will not change. David Petrovick, food pantry executive director, said the additional monthly distribution will offer more opportunities for area residents to use the Pantry. "Due to changes in the economy, client comments and input from other nearby food pantries, it became clear that our current single distribution in the morning was difficult for some to attend," Petrovick said. "We had been thinking about making more food available to more people for some time and our volunteers agreed to sign on to doubling the distribution." “We are more than grateful to our Barre Food Pantry volunteers for the additional time commitment needed to set up for this second distribution and for helping clients in the process of shopping their way through the available groceries. They saw the need and are stepping up to meet it.” Radlo said it will take some time to determine whether the added distribution will shift some residents to the new evening pickup session or reduce the number of home deliveries made each month. A second distribution each month will require more volunteer hours. If more residents are able to use the food pantry it could increase our monthly allotments from the Worcester Country Food Bank. 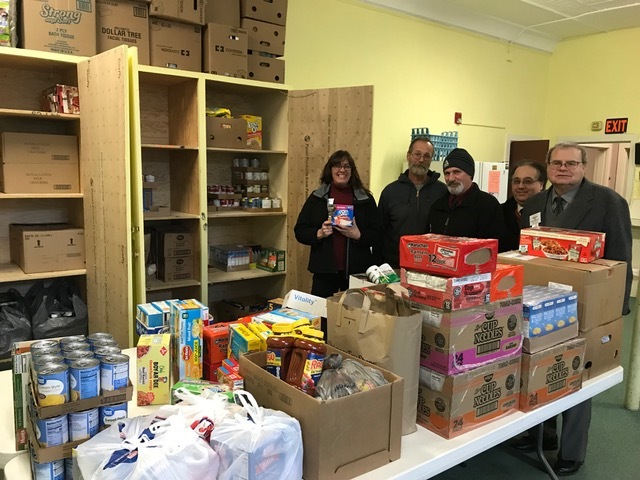 The Barre Food Pantry provides food assistance to more than 100 low-income residents and families in Barre, Oakham, New Braintree and Wheelwright at the Barre Congregational Church on the town common. To learn more about distributions, dates and times and for more information about volunteering at the food pantry, go to www.barrefoodbank.org. The food pantry welcomes volunteers of all ages and abilities and extends its thanks to its volunteers and community supporters. Hannaford also regularly donates meat, bread and pastry to the pantry. Hannaford's has a drop off for non perishable food/health and beauty products for the food pantry. The food pantry relies on donations of non-perishable food from the community and buys additional food from the Worcester County Food Bank in Shrewsbury. Financial donations to the food pantry can be sent directly to the church at 30 Park Street, Barre. Other local drop-off locations include the Barre Family Health Center (reception desk); the Barre Senior Center on South Barre Road; Woods Memorial Library; St. Joseph's Church and the South Barre Rod & Gun Club. The gun club is now a permanent collection site for the Barre Food Pantry. The club is currently collecting cleaning products, health and beauty products, laundry supplies, infant products and non-perishable food items. Your local church may also collect items for the food pantry after weekly services. Please ask at your church. From left: Lion Michelle Biron, David Petrovick, Food Pantry executive director, and Lions Joe Petracone, Sal Imperato and Tim Mara. The Barre Lions Club donated several hundred pounds of non-perishable food items to the Barre Food Pantry in February. The food was collected at the Massachusetts Lions District 33A Mid-Winter Conference held February 8 - 10 at the Double Tree Inn in Leominster. Most of the 49 clubs from district 33A had representatives at this conference. Barre Lions Club members brought the collected food to the Barre Food Pantry. The Food Pantry collects food from local donors, area markets and the Worcester County Food Bank. Volunteers serve more than 100 area families with a monthly distribution at the Barre Congregational Church and with emergency deliveries during the month. Donations of non-perishable food are accepted at the Barre Family Health Center (reception desk), the Barre Senior Center on South Barre Road, the Woods Memorial Library, at St. Joseph's Church and at The South Barre Rod & Gun Club. For information about how to volunteer, call Sonja Blaney at (978) 355-6921. For emergency assistance or answers to other questions call Chuck Radlo at (978) 355-6463. The Pantry uses cash donations to buy non-perishable and perishable items from local farms and businesses. We are very thankful for all of our supporters and volunteers; we cannot do our work without you! Drop off non-perishables at the library or at the Barre Family Health Center. 774-757-7888 for information about how your group can hold a food drive. set up the monthly distribution, carry groceries for clients each month or help deliver to shut-ins. For information about volunteering call Sonja @ (978) 355-4002. For emergency assistance or answers to other questions call Chuck @ (978) 355-6463 We will return your call. For information about volunteering call Sonja @ (978) 355-6921. For emergency assistance or answers to other questions call Chuck @ (978) 355-6463 We will return your call.